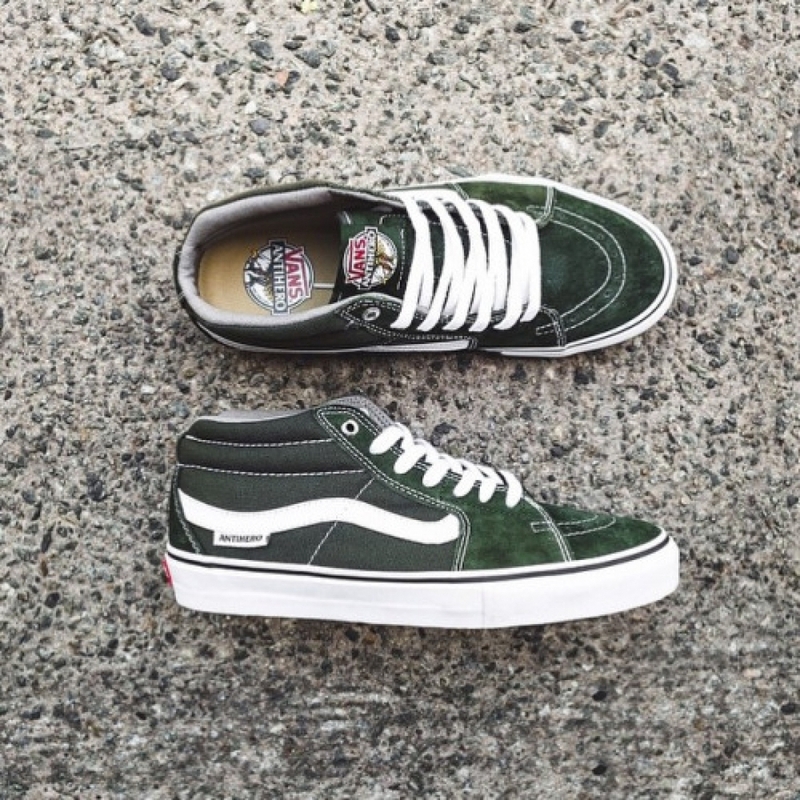 The Pro Skate line at Vans has teamed up with London's Slam City to celebrate one another birthdays with an exciting throwback release. Vans and Supreme team up to bring another classic style with updated tech and design. One of New York's finest teams up with Vans on a huge collection of footwear and apparel. Vans continues it's 50th Anniversary collection by collaborating with MTV on a 1990's inspired Era Pro. Vans continues it's 50th anniversary celebration with the rerelease of 4 iconic colorways of history making silhouettes. Each year, the All Nations Skate Project produces the "All Nations Skate Jam" (ANSJ), the largest and most prestigious skateboard competition for Native youth. ANSJ brings together Native-American skate companies, youth groups, non-profit organizations, skaters, musicians, dancers, artists, filmmakers, traditional craft vendors, contemporary artisans, and many others in a two-day festival and skate competition. The goal of the ANSJ is to give the reservation, pueblo, urban, and suburban Native youth a central gathering place to meet and celebrate their diverse Native cultures while competing in skateboarding. 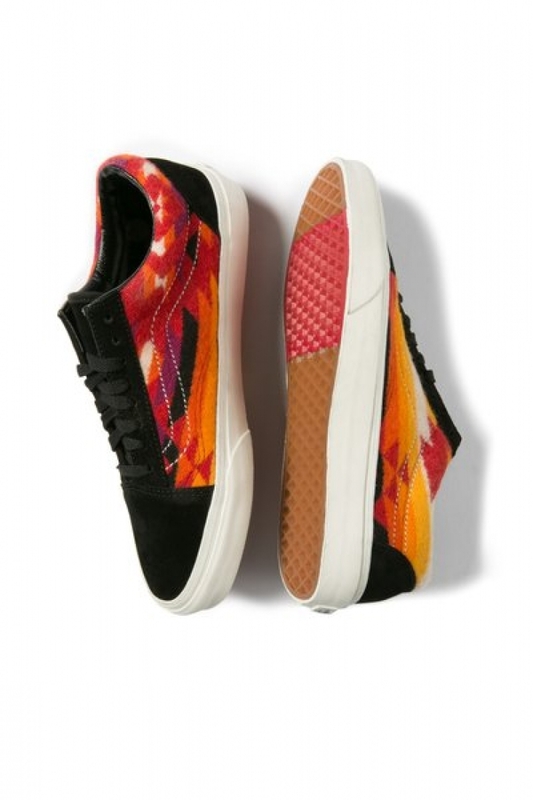 To that end, Vans teams up with New Mexico non-profit Nibwaakaawin and Pendleton Woolen Mills to create limited editions sneakers for this event. This year's collection consists of two pair of Old Skools and Slip Ons . 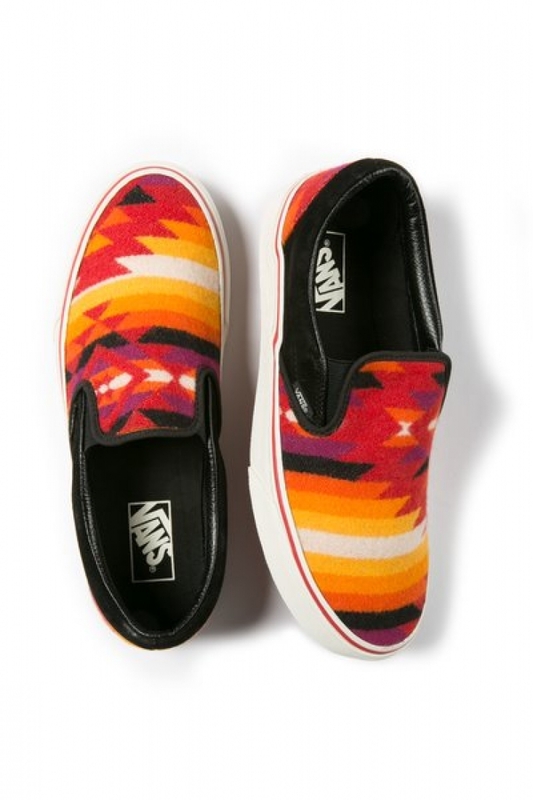 All pairs feature unique weaves from Pendleton implemented into their design. 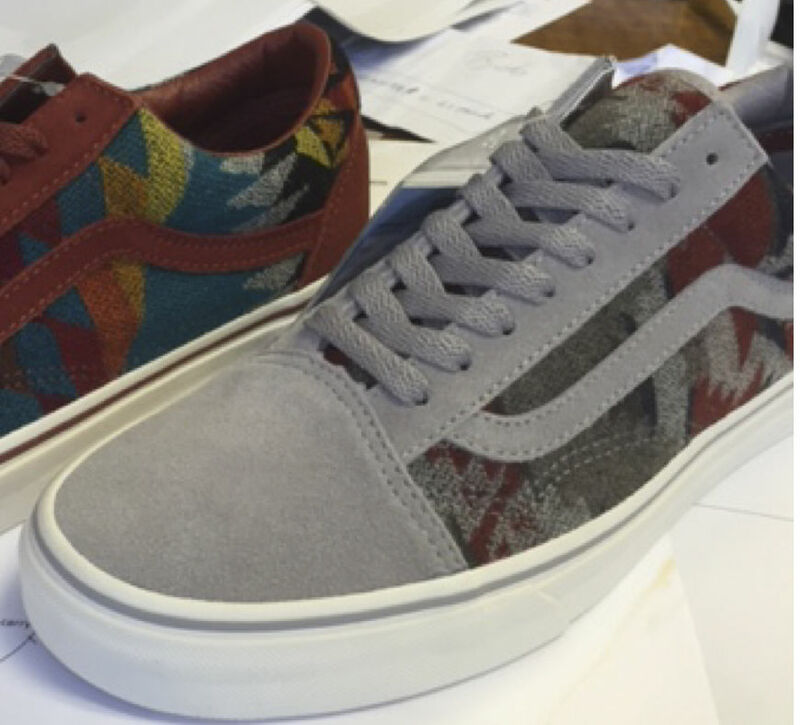 The 2016 collection from Nibwaakaawin x Pendleton x Vans is available for preorder now from NativeSkates on eBay. Be sure to check out the Skate Jam on April 30th if you are able to make it. Some time ago, we brought you the initial images of one of the things Vans had planned for their big 50th anniversary. Back then, we didn't have any release information to report. We are extremely happy to say that the time has come. The first wave of the 50th Anniversary Pro Classics will consist of the red/white Duke Kahanamoku Authentic Pro '66, the navy blue Authentic Pro '74, the red/blue Era Pro '76 (the first ever "Off the Wall" shoe), Tony Alva's blue Mid Skool Pro '79, and Spicoli's classic checkerboard Slip On Pro '82. The special 50th anniversary black/gold Sk8 Hi Pro and Authentic Pro is thrown in for good measure. All of the 50th Anniversary Pro Classics come with updated materials and the new UltraCush HD Pro insoles with special 50th Anniversary branding. The initial offering from the Vans 50th Anniversary Pro Classics Collection will be available tomorrow March 16th, from retailers like The Vans DQM General in NYC. 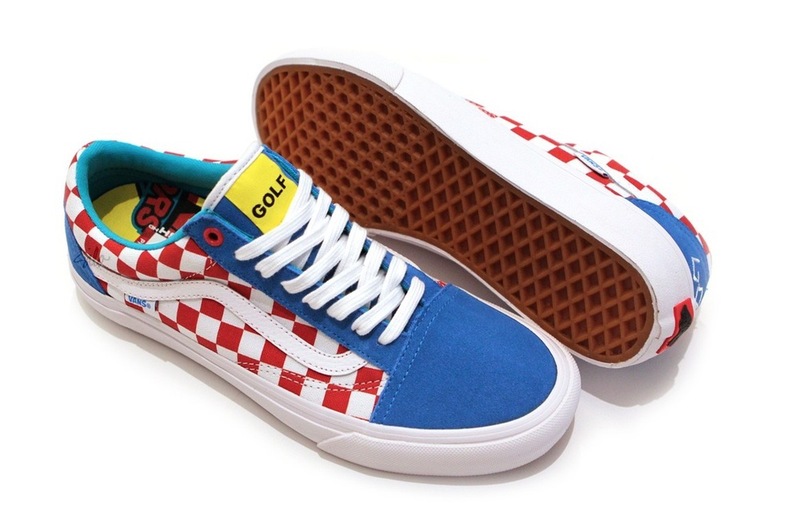 This is a global release and while they will be widely available from Vans retail stores and dealers, not all stores will have them in stock. Check your local retailer for availability. Last week, we posted some leaked photos from a japanese publications of an upcoming Supreme collaboration that was rumored to drop this week. This morning, we awoke to confirmation emails regarding the Supreme x Vans Era "Motion Logo." There isn't much to say about the shoes themselves: they are Era Pro's in the classic colorways of red, blue, black, and white with the very popular Supreme motion logo on stamped on the midsole. The white pair opts for a royal blue foxing stripe which give it a very OG feel while the other three go the more contemporary black. Other than that, the shoes are basically the same. What we can talk about, though, is the concept. ICYMI, this is a big year for Vans. And with that in mind, they have really been reaching back into their archives and putting out shoes that look like they could've been released in the 1970's or 80s. When Vans did collaborations in days gone by, this is what many looked like: a basic upper with branding on the midsole. There have been a lot of rumblings in the forum, Reddit, and on our Instagram about how simple or lazy this design is, as if those two words are interchangeable. For my part, I couldn't disagree more. I just hope that everybody calling these wack sleeps in on Thursday so I can get that white pair without too much heartache. The Supreme x Vans Era "Motion Logo" will release on Thursday, March 3rd, exclusively at Supreme stores in NY, LA, and London as well as online. A release in Japan is schedule for March 5th. 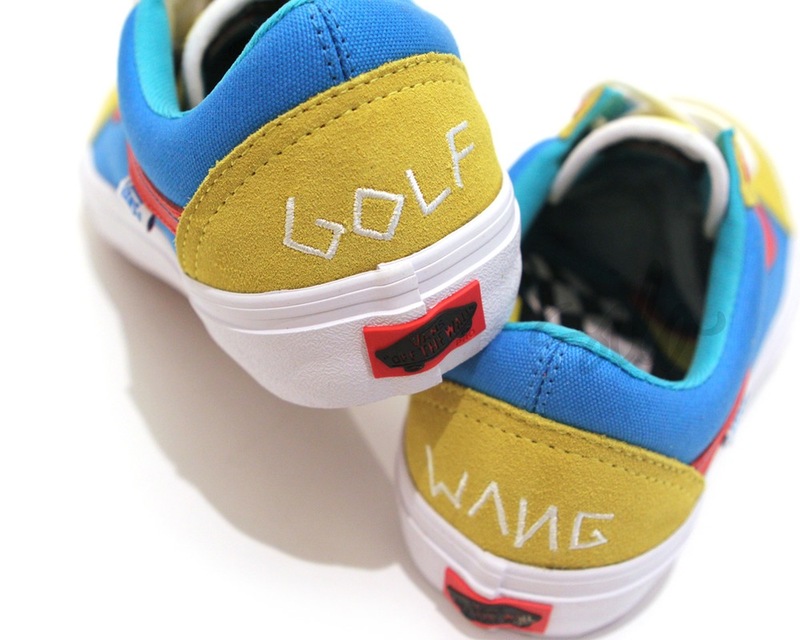 Love them or hate them, both iterations of the Golf Wang Syndicate collaborations were scooped up by collectors and resellers as soon as they hit store shelves. We held off on posting leaks of these for a couple of reasons. A major one being that there were never any high quality images and the few clear shots we did see were wrought with speculation. Thanks to Silo, we now have the hi-def images we were waiting for. 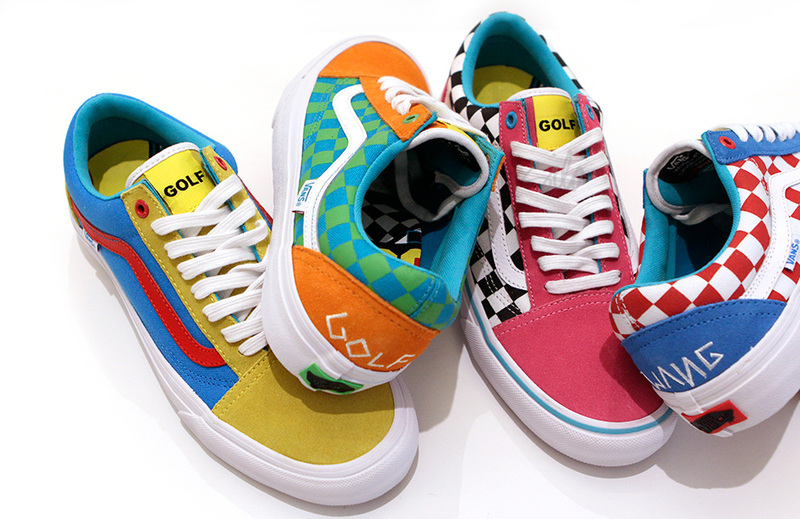 In some ways, this collection of yellow, pink, blue, and orange Old Skools are exactly what you have come to expect from Golf Wang: the loud choice of colors and embroidered "GOLF WANG" on the heel counter. In other ways, they are a little different: the choice of debuting the Vans Pro Classics instead of the twice used Syndicate silhouette. However you feel about them, they know their demographic and they play to that well. 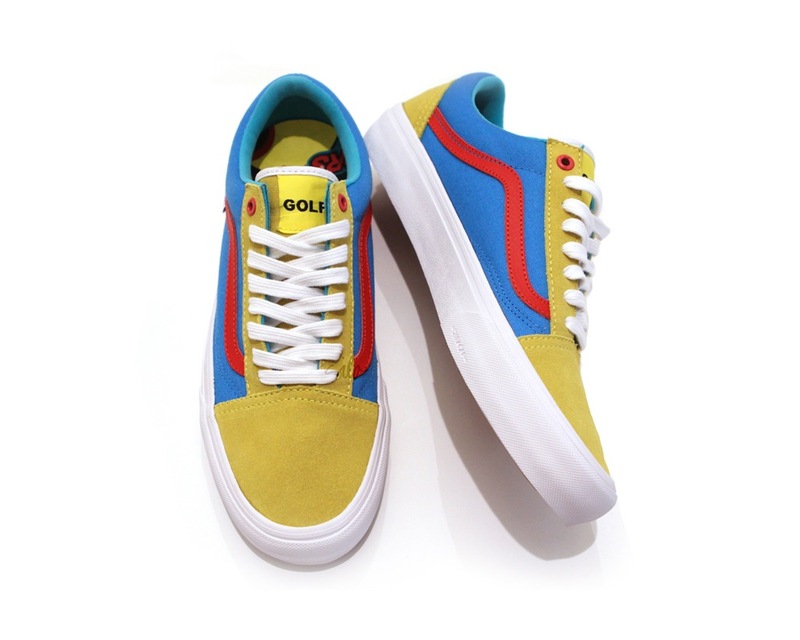 The Golf Wang x Vans Pro Classics Old Skool will release this Saturday, August 29th at Silo, both in-store and online. Check your local core skate shop for availability. Is this another nail in the coffin of Syndicate? Let us know what you think. We have all been waiting patiently for Vans to announce what they their plan was for their upcoming Golden Jubilee. In case you haven't been paying attention, our beloved brand is turning 50 next year. And it looks like they are pulling out the stops. We are happy to bring you a peek at the Vans Pro Classics line that will consist of the most iconic classics from milestone eras and pro skaters, all with upgraded tech for comfort and skate. Here is what we are so excited about. Duke Kahanamoku helped spread surfing throughout the world. This Hawaiian surf legend, actor, and five-time Olympic medalist handed Vans founder, Paul Van Doren, the shirt off his back to make custom shoes. The Authentic Pro ’66 celebrates Duke’s iconic Aloha print and his legendary meeting with Paul Van Doren. As one of the original members of the ’70s Z Boys skateboard team, Peggy Oki revolutionized the sport alongside other skate pioneers, including Stacy Peralta and Tony Alva. The Authentic Pro ’74 commemorates the Zephyr team’s explosion into the skateboard scene at the 1974 Del Mar Classic. An original Z-Boy, filmmaker, and co-founder of Powell Peralta Skateboards, Stacy Peralta brought his skate expertise into the design of Vans’ classic Era style in 1976. The Era Pro ’76 combines next generation function with the classic style of the first-ever Vans “Off the Wall” shoe. One of the most innovative skateboarders of all time, Tony Alva brought his brash, aggressive influence and ideas to create modern skate culture. The Mid Skool ’79 continues what T.A. started—skater-driven design built for progression. Vans’ most iconic style was introduced to the world in Fast Times at Ridgemont High. California’s youth culture, along with the Classic Slip-On, became a widespread phenomenon … thanks to a surfer and his kicks. Jeff Spicoli’s classic checkerboard Slip-On goes Pro with the Slip-On Pro ’82. Christian Hosoi combined raw power, incredible style, and a larger-than-life persona to take skateboarding from relative obscurity in the early ’80s to soaring global popularity by the end of the decade.The double checkerboard Sk8-HiPro ’83 recreates an iconic early colorway of the Sk8-Hi that cameto be known as the quintessential skate shoe of the ’80s. One of the first Freestyle BMX superstars, Eddie Fiola dominated the circuit and promoted this young sport to new levels of recognition. 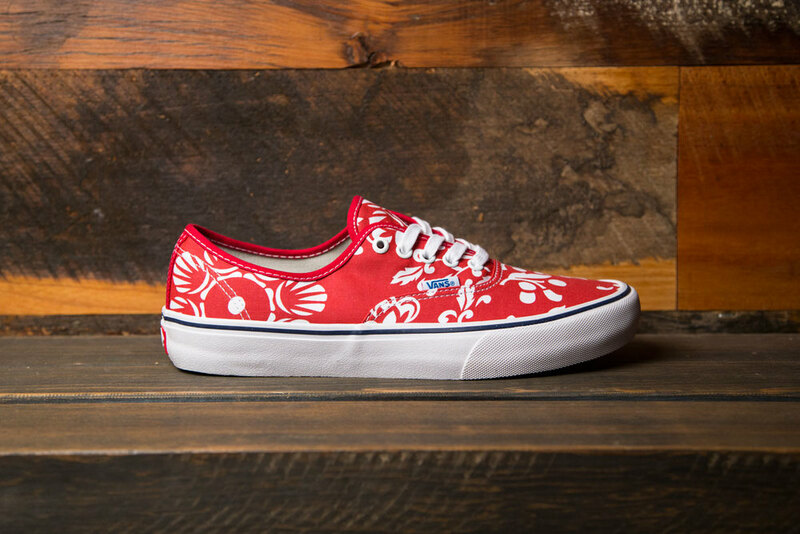 The Era Pro ’83 goes retro in red, white and blue—just like Eddie wore in his famous Vans ad. The Vans BMX team forfeited a national pro-level competition so they could perform the Helltrack race scenes and stunts in Rad, a cult classic tribute to BMX culture. A star is born … again. This film’s original Authentic is reinvented with modern Pro upgrades as the Authentic Pro ’86. From the Santa Cruz team in the ’80s to Black Label in the ’90s and AntiHero today, Jeff Grosso bleeds skateboarding. Jeff’s custom black & white twotone Sk8-Hi is reproduced with modernized Pro construction as the Sk8-Hi Pro ’87. Already a legend, Steve Caballero brought a higher level of functionality to the design of the first signature skateboarding shoe in 1989. The new revolution of street skaters adopted the Caballero, customizing it into what became the most iconic skate shoe of the ’90s—the “lighter, better, faster” Half Cab® in 1993. The Caballero Pro ’89 is upgraded to modern specs in its iconic original burgundy with croc emboss colorway. Ray Barbee helped define the culture and style of modern skateboarding by bringing skaters from backyard ramps to city streets. This pioneer of smooth style influenced an entire generation with his effortless, relaxed approach and positive attitude. The Old Skool Pro ’92 reintroduces the iconic white/black colorway and sleek shape from the early ’90s, upgraded to Pro functionality and cushioning. Unbridled enthusiasm, energy, and the ability to skate anything and everything with complete commitment, John Cardiel changed skateboarding … and his legendary skating will be revered for generations to come. The Chukka Boot ’93 transports the past into the future with an upgraded Pro construction in a nostalgic ’90s colorway. Proving that fashion and function can work together, Geoff Rowley’s first Vans signature shoe emphasized grip and boardfeel, allowing him to go full throttle while staying in complete control as one of the most influential skateboarders of all time. The Rowley Pro ’00 is reinvented with Pro functionality in the original all-black colorway. The Vans 50th Anniversary Pro Classics Collection will be available beginning in Spring 2016 and release throughout the anniversary year. Keep it tuned here for more information on these historic colorways as they become available. Each year, the All Nations Skate Project produces the â€œAll Nations Skate Jam" (ANSJ), the largest and most prestigious skateboard competition for Native youth. ANSJ brings together Native-American skate companies, youth groups, non-profit organizations, skaters, musicians, dancers, artists, filmmakers, traditional craft vendors, contemporary artisans, and many others in a two-day festival and skate competition. The goal of the ANSJ is to give the reservation, pueblo, urban, and suburban Native youth a central gathering place to meet and celebrate their diverse Native cultures while competing in skateboarding. 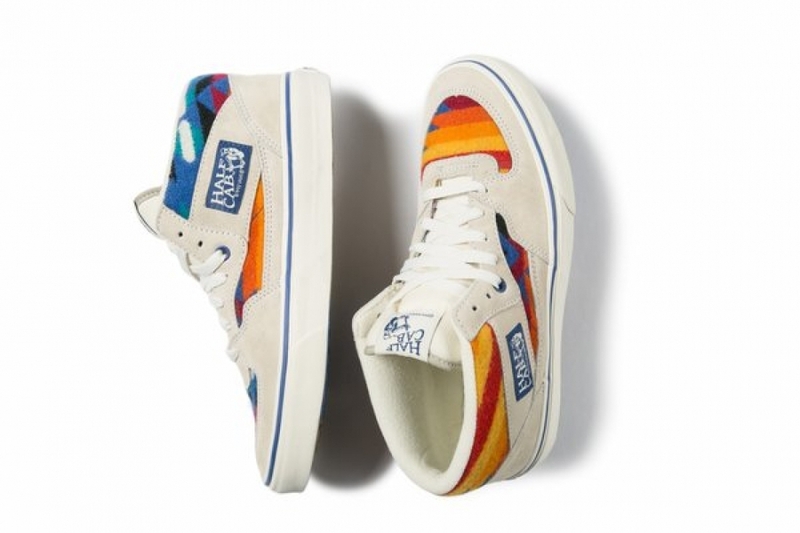 Every year, Vans teams up with New Mexico non-profit Nibwaakaawin and Pendleton Woolen Mills to create limited editions sneakers for this event. This years collection consists of two styles each of the Half Cab, Old Skool, and Slip On as well as one colorway of the Sk8 Hi, All pairs feature unique weaves from Pendleton implemented into their design. The leftover stock from the Nibwaakaawin 2015 All Nations Skate Jam is available now in very limited supply at All Nations Gear. OVERVIEW Part of the Vans x Antihero Collaboration, the Antihero Sk8-Mid Pro, a midtop take on the legendary high top and updated for enhanced performance, features a premium suede upper with original sidestripe, UltraCush HD Sockliners for advanced cushioning, and Duracap™ Toe Bumper and Upper Ollie Underlays for increased durability and extra reinforcement where needed most. This Pro Classic most definitely has Vans Original Rubber Waffle Outsole for increased support and stability. The Antihero x Vans Sk8 Mid Pro is available at core skate shops around the globe now. Every significant skateboarding video drops like a milestone, energizing the community by building on the legacy of its predecessors, beginning where the last one left off and taking up the baton for the culture to drive progression propelling skateboarding forward.